Ed Bitternose Sr. stands in a crumbling brick building staring out the window onto snow-covered fields, reclaiming the spot he took decades ago. "I remember sitting on the window sill on the second floor, leaning against it looking at my parents at home, wondering why I couldn't just go," says the 69-year-old Cree member of the George Gordon First Nation in Saskatchewan. 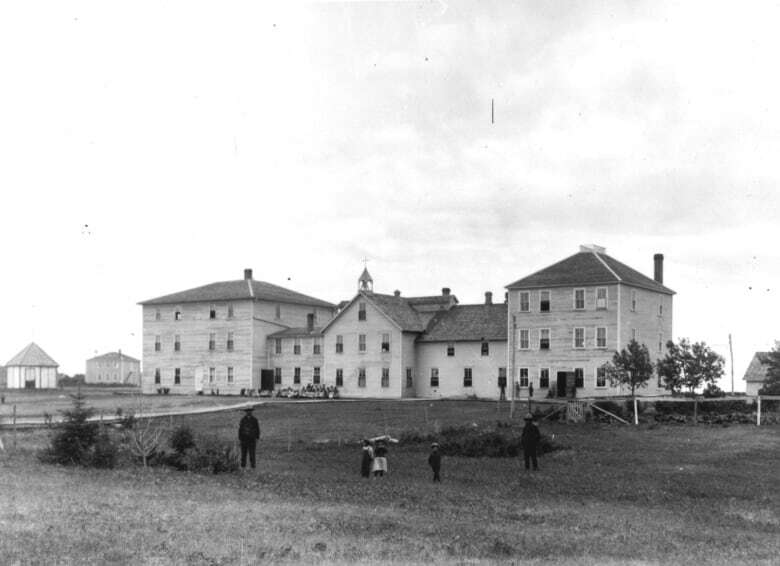 Bitternose attended Muskowekwan Indian Residential School, about 150 kilometres northeast of Regina and a mere 70 metres from Bitternose's family home. He remembers gazing at the white picket fence around their house. His mother worked as a janitor at the school and his father as a labour hand and later the boiler room engineer. Bitternose attended three residential schools, including the Gordon's Indian Residential School and the Qu'Appelle Indian Residential School in Lebret, Sask. Built in 1932, the Muskowekwan school is one of the 16 original residential school buildings left in Canada. Located on the First Nation of the same name, it was operated by the Roman Catholic Church until the federal government took it over in 1969. Unused and deteriorating, its future is uncertain — a fate not unlike the other 138 recognized residential school sites scattered across the country. While some First Nations are reclaiming the buildings or the land on which they stood, other schools are disappearing with time, leaving little evidence of the history of residential schools or recognition of the children who attended them. Canada's Indian Residential School system lasted more than 150 years, with the last school closing its doors in 1996. One-hundred-and-fifty-thousand Indigenous children across Canada were forced to leave their families to attend these schools as young as three years old. Bitternose was taken to Muskowekwan school when he was nine. He now lives on his home community of George Gordon First Nation, but has only visited the school a handful of times since he was a student there. "These brick buildings were built to last," Bitternose says, as he climbs out of the vehicle and grabs flashlights. Most of the school's windows are boarded up with plywood. The snow drifts hint he's probably the first visitor in a while. "Looks like one of the nuns left their vehicles," Bitternose laughs, pointing to a straw broom leaning in the corner. Broken glass crunches underfoot as Bitternose dodges hanging wires and holes in the floors. He says there used to be a cemetery beside the school. According to stories from the community, there are graves in the field, but the exact location and number of burials is unknown. There are no markers or tombstones. With nearly a hundred years of history and ground movement over that time, stories of human remains being unearthed or found aren't uncommon. Local residents and former students have indicated three possibly locations of graves around the school. Bitternose remembers finding remains more than once, as a child while he was playing near their family home and again in the mid-1990s while digging a hydro line for the Muskowekwan band. "I didn't think anything of it; it became kind of normalized," he recalled. In the summer of 2018, leadership of Muskowekwan First Nation partnered with the University of Calgary archaeology department to locate the graves using sonar, says band councillor Cindy Desjarlais. The First Nation is expecting a report this spring. Desjarlais says "once we figure out exactly where the unmarked graves are, we are going to fence it off and make a memorial." In 1999, at an event that hosted 335 former students and elders of the surrounding First Nations, the Muskowekwan band asked if they wanted it tear down the building since many other communities chose to do so. All but four voted to keep it. "They wanted to prove that these places existed, and if they tore it down then people might forget. Our children, our grandchildren will forget in 50 to 100 years," says Desjarlais. It has now been declared a provincial heritage site, and the community is taking steps to get designated at a national level. Desjarlais says the band is also looking at options to get the building renovated and turned into a museum, and possibly use it for local programming, like a healing centre or trade school. Bitternose says he'd "like to see them use it for something positive." "I think places like these residential schools should be recognized for what they were. We should be able to go read about our ancestors who were in residential schools and this would be a good place for it." The director of the National Centre for the Truth and Reconciliation, Ry Moran, says most schools given back to First Nations were torn down because of the abuses suffered by the children, other communities chose to reclaim the land by keeping the original buildings. Others still were sold as federal Crown land to private owners. "We have seen that a number of communities have tried to claim or reclaim those spaces," says Moran. "We are so supportive of any community's efforts to preserve those residential schools. There is a critical need to make sure that Canada does not forget and the built evidence is a critical component." Prince Albert, Sask., is home to some of that built evidence. The site of a former basic training facility for the Canadian Armed Forces was converted to a residential school after a fire displaced the staff and students from Lac La Ronge Indian School in 1947. The 41-acre area then became home to the Prince Albert Indian Residential School, located on the western outskirts of the city, until 1982. Three years later it received reserve status. Since then, services such as a daycare, health centre and education facilities for the Peter Ballantyne First Nation have reclaimed the land. It's also home to the Prince Albert Grand Council, a tribal council that represents 12 bands in northern Saskatchewan. The only original residential school buildings that remain are the old garage and gym, which are still used for functions and gatherings, says former Peter Ballantyne Cree Nation grand chief Ron Michel. "I am glad we were able to offer services back to our members: that was our goal when we first got the land back from the government — to help educate our own people." Other communities utilizing former sites include the St. Mary's Band in Cranbrook, B.C., which transformed the land into a successful golf resort. A teaching centre in Sault Ste. Marie, Ont., is located in the original building of the Shingwauk Indian Residential School. It focuses on teaching the history of residential schools. Between 2011 and 2013, the government allocated $20 million to commemorate former sites across the country. The fund was also used for ceremonies that honoured, educated and paid tribute to former students, their families and communities, according to a written response from Crown-Indigenous Relations and Northern Affairs Canada. Land not located on reserves was sold off as federal Crown assets to private landowners. The Thunderchild Indian Residential School is a prime example of that, located just off Highway 16 near the village of Delmas in central Saskatchewan. The school was run by the Roman Catholic Church from 1901 until 1948, when it was destroyed by fire that was said to have been started by students. It was never rebuilt and students were sent to other schools. Now an overgrown field, there is little evidence of the school's existence. Former student Jenny Spyglass, a 77-year-old Cree-Assiniboine from the Red Pheasant First Nation, attended the school from age three to seven. She still thinks about the place a lot as she lost a brother to tuberculosis there. He was buried at the school. Spyglass says she went to the former school site once in the 1990s to try find the graveyard, and remembers feeling disappointed at what she saw. "There were crosses there, but it was full of grass … broken crosses. You don't know which is which. I just stood there. I was shocked," says Spyglass. She would like to see the area cleaned up, a fence erected and a memorial installed for those buried there. "Put a tombstone around it in the memory of residential school students, so people can go up there. Nobody ever seems to talk about it now," she says. Bitternose makes sure the door of Muskowekwan school is closed completely behind him. When Bitternose finally told his father about the abuse he suffered at residential school, his father's response stuck with him forever. "'What do you do when something is broken? You fix it!' I remember the exact moment he told me that," says Bitternose. "And I try to teach others the same thing: you can't move forward carrying that monster on your back." He now owns a horse ranch on George Gordon First Nation, and says being comfortable with his own story has helped him help others. He says working with animals is healing, and every year he hosts a ride-along, inviting youth and adults to work with horses. "Even though my memories aren't all happy ones, I really think the building is a part of our history. I am glad the band there is doing something. It's all a part of the healing journey."